Our daily trains transportation in Metro Manila are not available in services during lenten season. 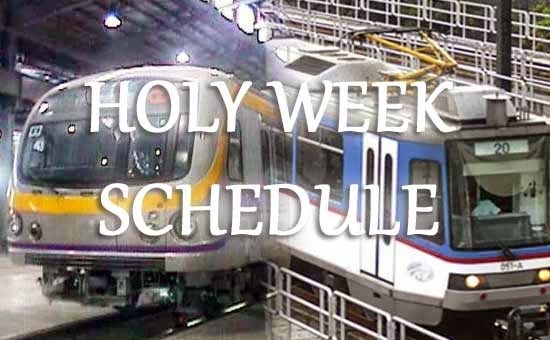 This Holy Week, MRT trains will stop its operations from Maundy Thursday until Easter Sunday. The LRT Line 1 with its routes from North Avenue station to Baclaran and LRT Line 2, which rolling from Recto station to Santolan will be closed tomorrow, Maundy Thursday up to Easter Sunday. But PNR trains has limited schedule on Thursday from 5:30 a.m. to 12 nn on Thursday but closed from Friday to Saturday and limited operations again on Sunday. Officials also explained that during this Holy Week, they will take the opportunity to repair some trains and tracks for effective services. All trains operations will be back to normal on Monday, April 6, at 5 a.m., according to MRT, LRT, and PNR officials. Meanwhile, the new ticketing system will be implemented starting May 2015, so expect the changes on the said month to LRT and MRT operations. Comments or suggestions about "LRT, MRT and PNR Schedule on Holy Week 2015" is important to us, you may share it by using the comment box below.